Highly recommended for all air gage readouts unless supply air is already conditioned with high quality oil and water removal equipment. 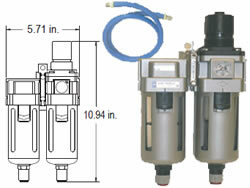 The AFR-12 filter assembly contains a 50 µ prefilter, factory preset regulator, and a submicron coalescing filter with automatic bowl dump. Input 85 to 150 psi, output is regulated to 80 psi. One filter assembly will handle two readouts with 4 air channels each. 1/4-NPT connections, supplied with 3.3 ft (1 m) hose. Mini Filter supplied on MilliCheck, Micro IIi and AEK readouts. Clear plastic bowl with five micron element, 1.1 oz. fluid capacity with automatic drain. Air Input Hose .25 ” I.D. 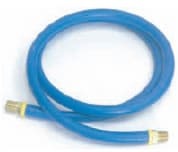 x .50″ O.D rubber air supply hose with 1/4 NPT male connections. Use dash number to indicate hose length. 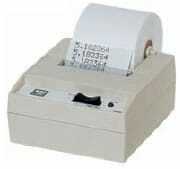 Mini-Printer provides inexpensive data logging capability for Micro-Air Readouts The IMP-24 printer uses standard adding machine paper. Black ribbon cartridges are easily replaceable. The Mini-Printer comes complete with serial communication cable and power supply. Foot switches for commanding Print and T.I.R functions on Micro IIi Readouts. Attach suffix P or T to indicate Print or TIR interface. (They may also be used with P.C. Workstations, check with factory for compatible connectors). Heavy duty model is recommended for shop floor usage. 4 ft.with 9 pin Sub-d female-female connectors. Use on Micro IIi to PC serial ports, and AEK serial port to the GageChek secondary serial port. Same as PCC-9 except the input/output lines are cross-over wired. Use on AEK serial port to GageChek primary serial port. AEK Analog interface cables Connect AEK air/electric converters to GageChek or CWK Gage station analog input ports; Sub-d, 9 pin male connector splits to 1 to 4 lines with DIN or Hirose connectors, 4 foot long. Add dash number to order code to specify number of lines. PSR-30 Standard power supply for North America 105 – 125 VAC, 60 Hz. (Included with MilliCheck Readouts). PSR-31 Universal supply, 100 – 240 VAC 47-63 Hz. Includes adapter kit for (North America, UK, EURO, & AUST.). Toggle Valve Manifold connects to front of Air Gage Readouts allowing the use of multiple air gage members on the same readout without the fuss of disconnecting and reconnecting hoses. Manifolds are available in up to 9 stations. Support legs are standard on manifolds with 4 or more stations. Model ABS-( ) Lift Stand with lever actuator positions air probes and air ring gages at multiple inspection locations. Includes adjustable limit stops, detents and chuck for gaging members. Models cover stroke ranges up to 2.10″. Applications include inspection of bearing races, valve sleeve & spools, fuel injector components. Order code: Consult factory for details. See pages 19 & 21 for Handle, hoses and fitting for air gage members.